Snowflakes of many shapes, colors and skill levels will be available on which to work. I have two great books full of various snowflake patterns. One book is 99 Snowflakes, no author stated. The second book is new to Japan, 100 Snowflakes to Crochet by Caitlin Sainio, 日本語、AND it has the easy to read, universal crochet symbol diagrams! Or bring your current crochet Work-in-Progress. I’d love to see what you are working on, also! Anyone interested in Crochet work is welcome. No charge for the Crochet with the Artist workshop but please at least make a small purchase at the Hagiso Cafe as we are using their space for Crochet. This is event is running at the same time as Geikoten, many more reasons to visit Yanaka! Looking forward to crocheting with you! 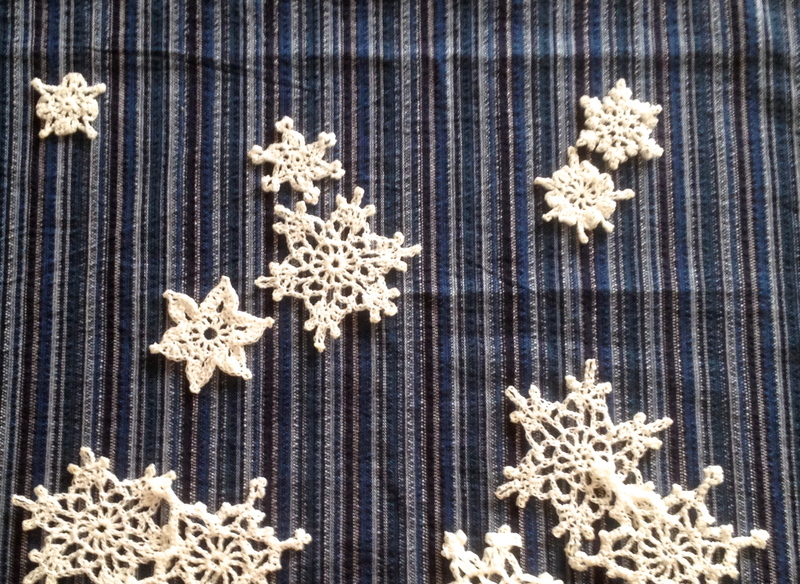 The snowflakes look lovely, I can’t wait to make one.